GIS (geographic information system) is a totally cool technology that has been called "geography on steroids." GIS is what lets you see the schools in your neighborhood or tells you where the nearest McDonald's is. GIS For Dummies tells you all about mapping terminology and digital mapping, how to locate geographic features and analyze patterns such as streets and waterways, and how to generate travel directions, customer location lists, and much more with GIS. Whether you're in charge of creating GIS applications for your business or you simply love maps, you'll find GIS For Dummies is packed with information. For example, you can:* Learn all the hardware and software necessary to collect, analyze, and manipulate GIS data* Explore the difference between 2D and 3D maps, create a map, or manage multiple maps* Analyze patterns that appear in maps and interpret the results* Measure distance in absolute, comparative, and functional ways* Recognize how spatial factors relate to geographic data* Discover how GIS is used in business, the military, city planning, emergency services, land management, and more* Find out how GIS can help you find out where flooding may occur* Determine what your organization needs, do appropriate analyses, and actually plan and design a GIS system You'll find dozens of applications for GIS queries and analyses, and even learn to create animated GIS output. 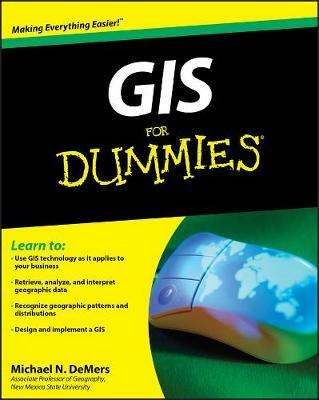 Whether your goal is to implement a GIS or just have fun, GIS For Dummies will get you there! Note: CD-ROM/DVD and other supplementary materials are not included as part of eBook file.